Why should cars dominate this city? Traffic planner Axel Wilke thinks we should be investing in more public transport. Can the plan (DEMP) gains traction and we take a trip into the past at St Albans Park as it reopens again after the completion of drainage work. 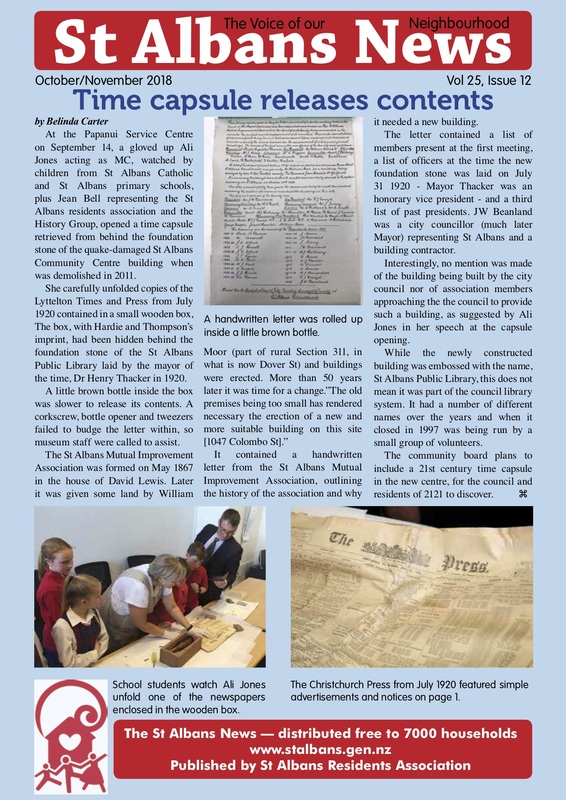 All this and more in the April/May edition of St Albans News. Click on the image to download. By now you should have seen the information booklet on options, stages and priorities for the Northern Corrider downstream effects, providing you with the 4 drop in sessions to be held in St Albans March 20, 25, 26 and April 4, or visit ccc.govt.nz/have your say if you cant make any of these. Your feedback is valuable and important. This project is the most long standing and controversial issue St Albans has ever had imposed on it, and emotion is understandably running high because this is something the community has strongly resisted for decades. Please make you views known; what you strongly oppose, what you support, any other ideas you have. As the City Councillor for Innes I am aware of conversations in the community reflecting strong support for options like park and ride/cycle facilities, High occupancy vehicle lanes, traffic calming for vulnerable residential streets, slow zones, safety measures for pedestrian and cyclists, and protection for local businesses . These are all align with the Governments’ Global Policy Statement for Transport, will also contribute positively to our Climate change goals , and should be considered in that context. I am aware too of concerns that traffic diversion away from Edgeware Village could have adverse effects on businesses, concerns around any proposed parking losses, effects on other local business areas, noise, emmissions, rat running. I am also hearing that some residents would like to see nothing, or minimum treatment, with the idea that if its hard for the cars to get through then people will be more inclined to use Public Transport, park and ride or other alternatives. So please continue to engage on this complex issue by making a submission by 15th April. There will be an opportunity for you to speak to a combined meeting of the Papanui /Innes and Linwood/Central/Heathcote Community Boards. The final decision will be made by the full Council later in the year. 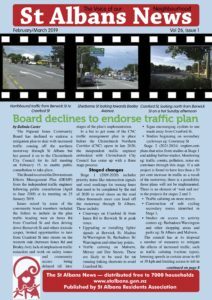 At the February 14 Christchurch City Council Meeting councillors had the opportunity to ask questions about the downstream effects management plan (DEMP) dealing with traffic coming off the motorway in 2020. The answers were provided by independent traffic engineer Dr Shayne Turner or Richard Osbourne who is employed by the city council and works alongside Dr Turner. Councillors’ questions and comments are in bold. Some answers have been abbreviated and/or interpreted by Mark Wilson. In less than 18 months, traffic will spill off the motorway heading for the city via St Albans, adding to the congestion and making living here less safe, so many people are not filled with joy at this prospect, including the Papanui Innes Community Board who have declined to endorse the latest plans. The Christchurch City Council is about to host another round of consultations about the three stage plans for Cranford St, downstream of Innes Rd – a process, with lots of studies and sub-projects (that could continue on and off for the next decade) aiming to make the streets safer. In our history section we take a look at a small private school that ran in Mays Rd until the 1940s and we were interested to hear from historian Margaret Lovell-Smith about a number of men living in St Albans who opposed the war in Europe. We also take a look at a scheme helping disadvantaged people purchase bicycles. 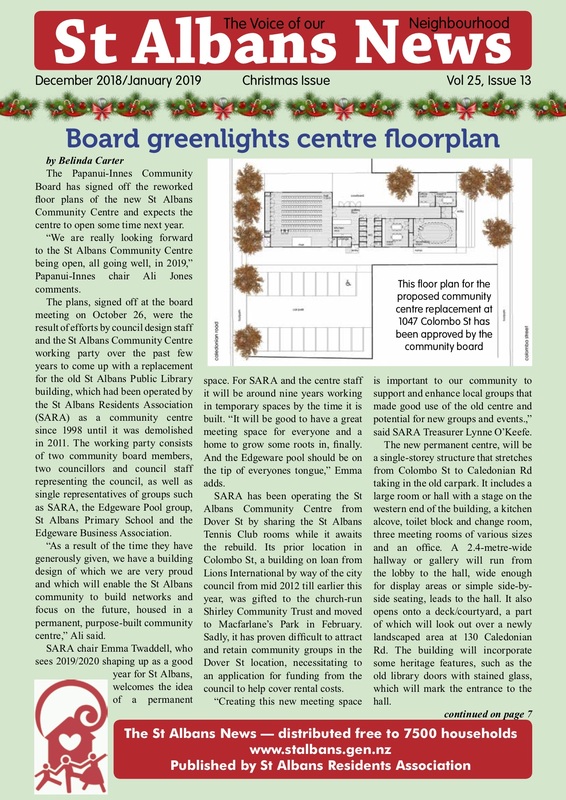 All this and more in the February/March edition of St Albans News. Click on the image to download. SARA’s Christmas party on November 25 is also a time to celebrate the 25th anniversary of the first issue of St Albans Neighbourhood News in December 1993. 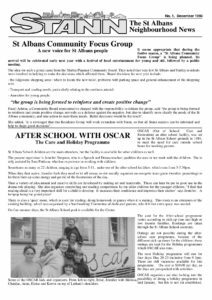 It is also 20 years since SARA opened the St Albans Community Resource Centre at 1047 Colombo St (October 19 1998) (residents association). A key part of the centre was the computer room operated by St Albans NeighbourNet, run by volunteers with the aim of helping people with computers and internet access. The community centre is currently operating from the St Albans Tennis Club premises in Dover St.
St Albans News can date its history back to December 1993 when some community-minded individuals decided it would be a good idea to produce a newsletter for Christchurch’s largest suburb.The replacement community centre inches closer with a decision on the floor plan by the Papanui Innes Board and Spanish flu, which peaked the same month WWI came to an end in November 1918 feature in the December/January issue of St Albans News. We also have a centre page feature we have put together for Christmas featuring a recipe for meringues. Download the December 2018/January 2019 issue by clicking the cover image. 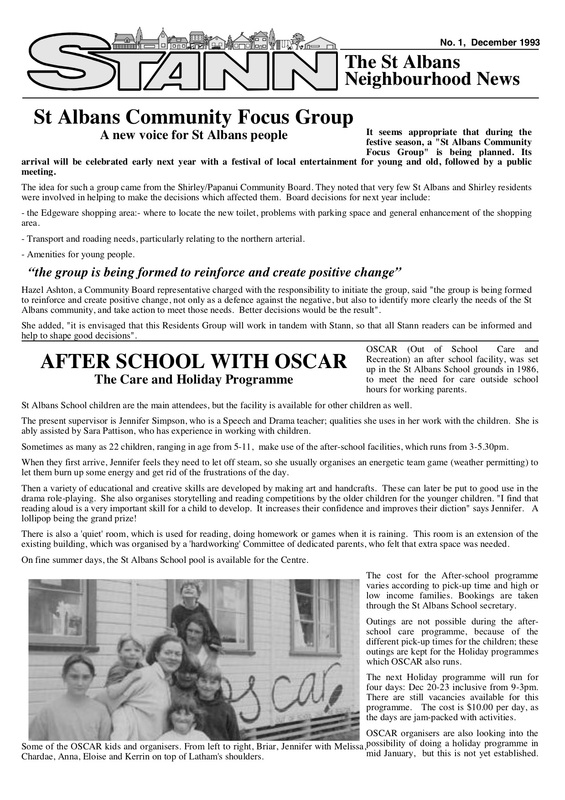 We have had enquiries about how to subscribe to an emailed version of St Albans News. This can be arranged if you subscribe by filling in this pop up form. It will be sent to news@stalbans.gen.nz. If you don’t wish to subscribe you can dismiss the popup by clicking on the x to close it. When the time capsule planted in 1920 behind the foundation stone in the old community centre was opened in September it contained a small brown bottle and a letter inside. The bottle was reluctant to give up its dry contents but eventually did. The opening was recorded in the October/November StAN and made reference to the letter and some of the names contained within. Click to read the transcribed letter The Christchurch City Council has transcribed the letter in full. Some of those names were men who played a prominent role in 19th century Christchurch and in the public library which replaced the Mutual Improvement Society’s building in Dover St,later to become the St Albans Community Centre. Find out what was in the time capsule rescued from the old community centre after the quakes. It was hidden behind the foundation stone. The new co-ordinator for Packe St park talks sustainability, resilience and more in the October/November issue of St Albans News. Download by clicking the image to the right. One of the questions asked in the submissions to the council over the traffic plans for areas downstream of the Northern Arterial related to street calming measures on side streets. The council has summarised the submissions on its Have Your Say website and built up intersections was the preferred method for those who submitted (193) followed by street narrowing (126). 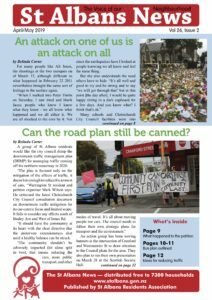 https://ccc.govt.nz/…/2…/July/4.-Traffic-calming-options.pdf. Christchurch list MP Nicky Wagner (National) hopes her Member’s Bill to legalise and regulate the use of electronic cigarettes is chosen for debate in Parliament. Insurance lawyer turned MP Duncan Webb says the Earthquake Tribunal will be a “radical circuit breaker” for Christchurch. Webb, now the MP for Christchurch Central, represented claimants against both EQC and insurance companies while in practice and now runs regular clinics to guide claimants. “Problems with access to justice have plagued post-quake Christchurch. This legislation sets the scene for an informal, inquisitorial, speedy tribunal,” he says. Many claims had stalled because of the unwieldy and expensive High Court process.